Tronics Model 3S3, stainless steel, left hand, front, back and wrap pressure sensitive labeler rated from 100" to 1,200" on front / back labels and 50" to 600" on wrap labels per minute with number of product – depending on materials and application. Label size range: 1" to 8-1/2" in Height; 12" in length and can handle containers up to 8" in diameter. Equipped with 120" long x 7-1/2" wide plastic Delrin product in feed conveyor with adjustable guide rails, 60" long x 1" wide top hold down conveyor, spacing wheel, aligning chains for container squaring, dual label heads with 9" high peeler plates and 16" long x 6" high side wrap conveyor all hand crank adjustable. Control panel has touch pad controls with read out and e-stop. Mounted on stainless steel base frame with casters and leveling legs. Tronics, model S3S, inline, stainless steel, pressure sensitive, wrap labeler. Rated up to 1,200 inches of label per minute – depending on materials, application and machine configuration. Label specifications: ½" to 9" in Width; ½" to 18" in Length. Equipped with a 120" long x 7½" wide Delrin belt conveyor with adjustable guide rails, product timing wheel and 20" long x 5½" high wrap belt. Control panel with touch pad display. Tronics 3TDS031CDE automatic, pressure sensitive front, back, and neck wrap labeler. Capable of labeling round, flat sided, and oval containers. Equipped with 132" x 4-1/2" product conveyor, dual worm screw infeed, top container hold down belt, front, back and neck label heads. Touch pad controller with up to 100 job memory. Tronics Model 3S3, stainless steel, right hand, front, back and wrap, pressure sensitive labeler. Rated from 100" to 1,200" on front / back labels and 50" to 600" on wrap labels per minute with number of product – depending on materials and application. Label size range: 1" to 8-1/2" in Height; 12" in length and can handle containers up to 8" in diameter. Equipped with 120" long x 7-1/2" wide plastic Delrin product in feed conveyor with adjustable guide rails, 60" long x 1" wide top hold down conveyor, spacing wheel, aligning chains for container squaring, dual label heads with 9" high peeler plates and 16" long x 6" high side wrap conveyor all hand crank adjustable. Control panel has touch pad controls with read out and e-stop. Mounted on stainless steel base frame with casters and leveling legs. Tronics Model 3S3 front, back and wrap, stainless steel, pressure sensitive labeler rated from 100" to 1,200" of front / back label and 50" to 600" of wrap label per minute – depending on materials and application. Label size range: 1" to 8-1/2" in Height; 12" in length and can handle up to 8" in diameter containers. Equipped with 120" long x 7-1/2" wide plastic Delrin product in feed conveyor with adjustable guide rails, 60" long x 1" wide top hold down conveyor, spacing wheel, aligning chains for container squaring, dual label heads with 9" high peeler plates and 16" long x 6" high side wrap conveyor all hand crank adjustable. Label roll diameter 12" on 3" core, with up to 9" web width. Swivel head control panel with microprocessor and multiple touch panel controls. Mounted on stainless steel base frame with casters and leveling legs. Tronics Model 3S3, stainless steel, front, back and wrap, pressure sensitive labeler rated from 100" to 1,200" on front / back labels and 50" to 600" on wrap labels per minute with number of product – depending on materials and application. Label size range: 1" to 8-1/2" in Height; 12" in length and can handle containers up to 8" in diameter. Equipped with 120" long x 7-1/2" wide plastic Delrin product in feed conveyor with adjustable guide rails, 60" long x 1" wide top hold down conveyor, spacing wheel, aligning chains for container squaring, dual label heads with 9" high peeler plates and 16" long x 6" high side wrap conveyor all hand crank adjustable. Tronics Model 3S3, stainless steel, pressure sensitive wrap labeler rated from 100" to 1,200" on front / back labels and 50" to 600" on wrap labels per minute with number of product – depending on materials and application. Label size range: 1" to 8-1/2" in Height; 12" in length and can handle containers up to 8" in diameter. Equipped with 120" long x 7-1/2" wide plastic Delrin product in feed conveyor with adjustable guide rails, 60" long x 1" wide top hold down conveyor, spacing wheel, aligning chains for container squaring, dual label heads with 9" high peeler plates and 16" long x 6" high side wrap conveyor all hand crank adjustable. Tronics Model 3S3, stainless steel, front, back and wrap, pressure sensitive labeler rated from 100" to 1,200" on front / back labels and 50" to 600" on wrap labels per minute with number of product – depending on materials and application. Label size range: 1" to 8-1/2" in Height; 12" in length and can handle containers up to 8" in diameter. Equipped with 120" long x 7-1/2" wide plastic Delrin product in feed conveyor with adjustable guide rails, 60" long x 1" wide top hold down conveyor, spacing wheel, aligning chains for container squaring. Tronics Model S3M, inline, pressure sensitive, wrap labeler rated up to 1,200 inches of label per minute with number of containers – depending on materials and application. Label specifications: 1/2" to 9" in Width; 1/2" to 14" in Length. 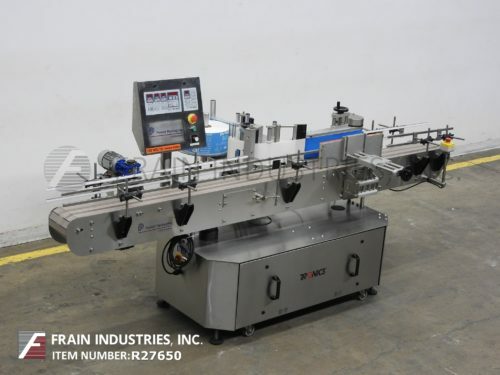 Equipped with 112" long x 7-3/4" wide Delrin belt conveyor with adjustable guider rails, product timing wheel, 9-1/4" high peeler plate, 16" long x 7" high wrap belt hand crank adjustable and 14" OD label disc on 1-1/2" core. Swivel head control panel has touch pad controls with read out and e-stop. Mounted on height adjustable legs and casters. Tronics Model TDS03CD, compact, front, back and wrap pressure sensitive labeler rated from 0 to 1,200 " per minute with number of containers – depending on materials, application and machine configuration. Label size: up to 8-1/2" in Height; up to 12-1/2" in Length. Equipped with 96" long x 7-1/2" wide Delrin conveyor with adjustable guide rails, 16" long x 3 wide top hold down belt, dual label heads with 14" high peeler plates, wipe on brushes and 8¾" H x 18" L wrap station. Control panel has touch pad controls, with label heads, wrap, overhead and product conveyor, machine speed and e-stop. Mounted on casters with leveling legs.